OPI’s most recent collection is the Texas Collection. It’s been out for a while now, and is widely available. The last time I was in Ulta, it was all over the place! I checked out the swatches that popped up online and decided to try just a few of the polishes with what OPI is calling a “sorbet” finish. The term has created some disagreement, because this finish is similar or identical to the jelly finishes that have been around for a while, even though OPI says sorbet finish is new. I don’t have any jelly polishes, except for a dark red, so it didn’t really matter to me if the finish is similar. And the pictures of the OPI colors are so pretty and summery! I used the handy swatch set that OPI provides with their displays to pick out the two that I think are best for my skin tone: Guy Meets Gal-veston and Do You Think I’m Tex-y. Today I’m posting my swatch of Guy Meets Gal-veston, and the other color will follow later (Ed: my Do You Think I’m Tex-y post is now up!). Guy Meets Gal-veston is a bright coral color with pink undertones. I used three coats, and the application was really great–the polish wasn’t streaky at all even though it’s pretty sheer, and it covered the nail nicely. This picture is without any topcoat-it dries very shiny by itself. It’s translucent and fruity looking, but I think the opacity is still good. Especially on shorter nails like mine, the slight visible nail line doesn’t bother me. I really like this color! 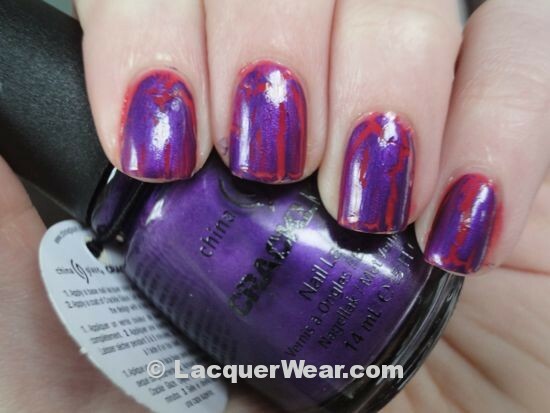 But, then I thought that I would try it with China Glaze Fault Line, a shimmery purple crackle polish. Guy Meets Gal-veston pops off the nail and is so bright that I thought it would create a nice contrast. This did not happen. Based on this try, I won’t be using jelly or sorbet polishes under crackle polishes in the future–the crackle overwhelms the base color. I think when the juicy shine of the jelly finish is broken up by the crackle, the color of the jelly polish gets washed out and fades to the background. All I could see when I wore this combination was the bright purple shimmer. Now I know. Opaque or at least glittery works way better under crackle.